Alrighty! Looks like I’m gonna have to make a dash to the station. The guy I am interested in has a girlfriend. Go! Go! Me! Just like that, good vibes! You’re doing great, me. Don’t loose, don’t get flustered, don’t get disheartened! That’s right, today I’m living to the fullest. but the work just keeps piling up. Alrighty! I’ve just gotta work harder on this. I’ll start my diet again tomorrow. There are only 2 more days until the weekend, 2 more days! That’s amazing!, me. You’re nice, sweet, and patient! This was my translation of “Have a nice day” from her “Just LOVE” Album. Please note that Japanese is my second language and this translation is just my interpretation of the lyrics based on my knowledge of the Japanese and English language. If you have any suggestions to better it, please comment below! Also, I do not own the rights to these song lyrics. I had such a fun time translating this really light and fun song! 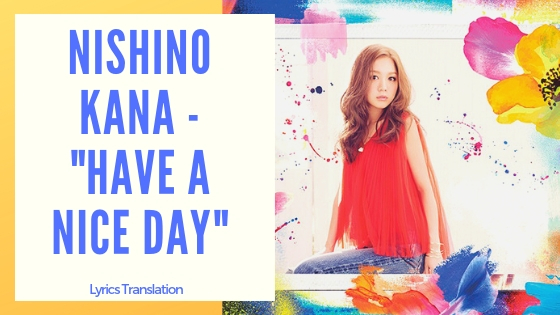 I love Nishino Kana’s lyrics and this song may seem childish, but if you look a bit deeper I see a song that is motivating and positive, telling you to work hard but don’t be too hard on yourself sometimes. Self-love I guess?